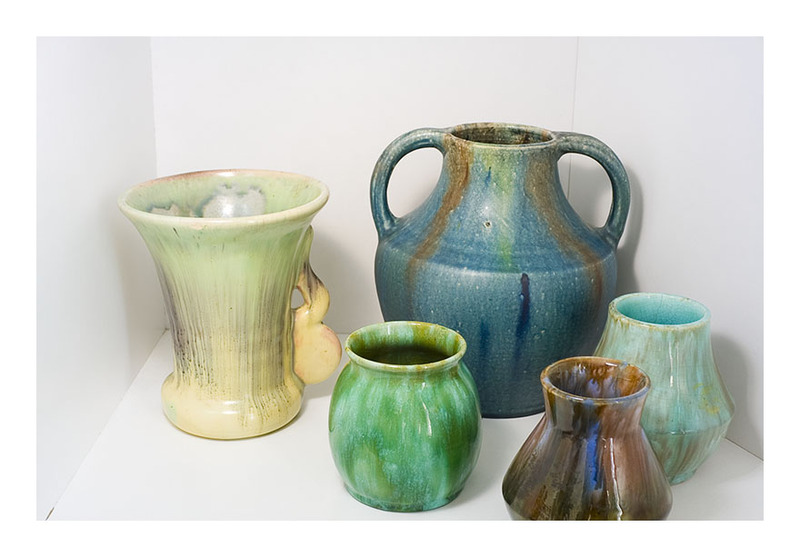 Here is a collection of my partner Trish’s vases. She collects vintage Australiana while I collect kitschy Australiana. And I totally agree that 20s ceramics – with that art deco styling- are fantastic. 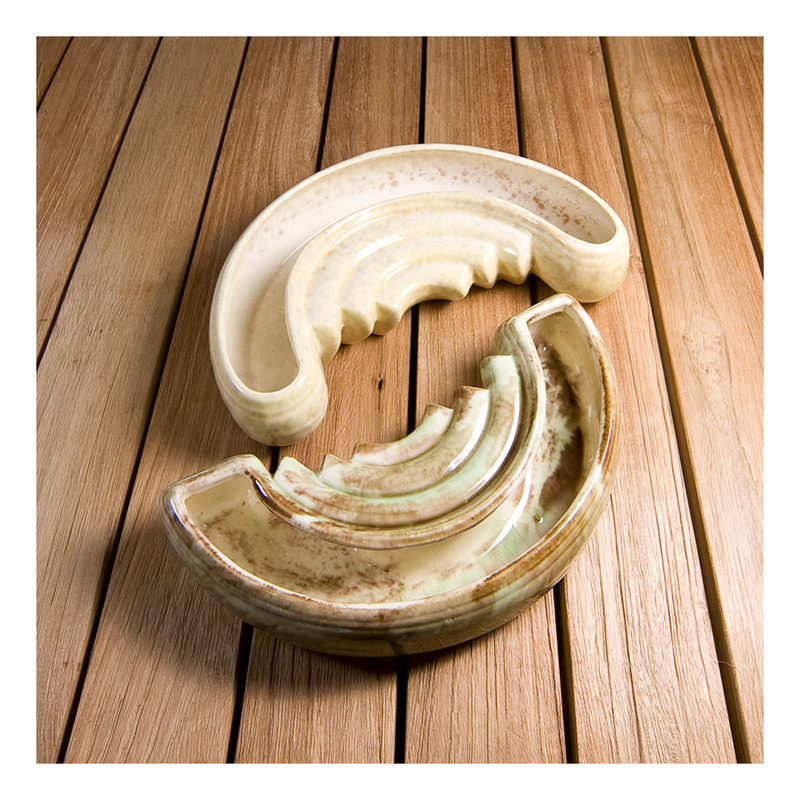 Newtone experimented with aspects of ‘Australian’ colours- if not forms- earlier than most Sydney potters. This is serious art pottery- none of your whimsical, populist, mass-produced stuff. These three vases are styled with a range of Australian flowers. And fruit for healthiness. And a vintage map. I think Trish will approve. 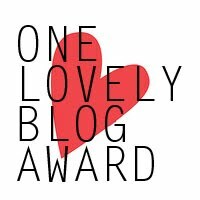 I never know until she reads my blog posts- at the same time you do! Here are two more vases from my vast Diana pottery collection. I particularly like these post-war pieces with their ‘kangaroo- haunch’ bases. 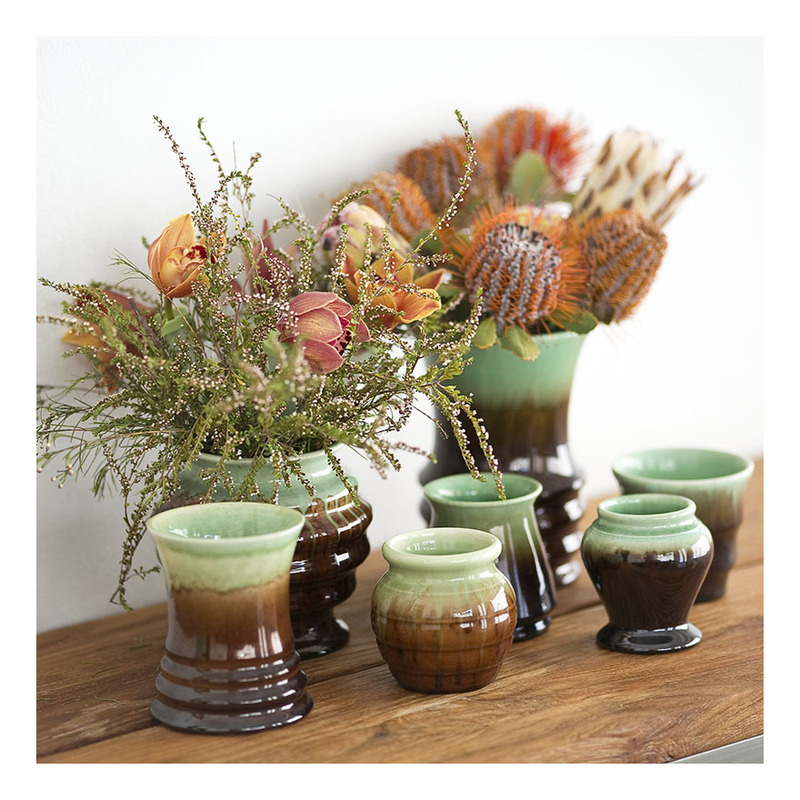 The vase bases -together with the green & brown colours – represent Australian nationalism at its best. I’ve teamed the Diana vases with a black perspex / cream Goudy font reprographic board. This board is c. 1960s but I like way it frames the vases- as well as the simpatico cream coloured font. These posey vases were made by Pates Pottery, which operated out of Belmore, Sydney from 1946 -1990. As you may have noticed, given the tenor of the posts of this blog, being a Sydneyite I have an affinity for the potteries here that were producing domestic ware in the 40s, 50s and 60s. These two vases didn’t start out as a pair- but they exemplify the fashion of the day: buy one half now, and save up for another to make a pair later on. The drip glazes were different on each vase so it was easy to make a pair out of vases that may have been made a decade apart. The posey vases came in mottled shades of pink, yellow, brown and green- and could stand alone as a ‘half moon’ or be paired with another to make a ‘full moon’. The deco styling of the vases is deliberate, although they were made much after that period; it seems nostalgia for things past [and styles familiar and remembered] has always influenced pottery makers. 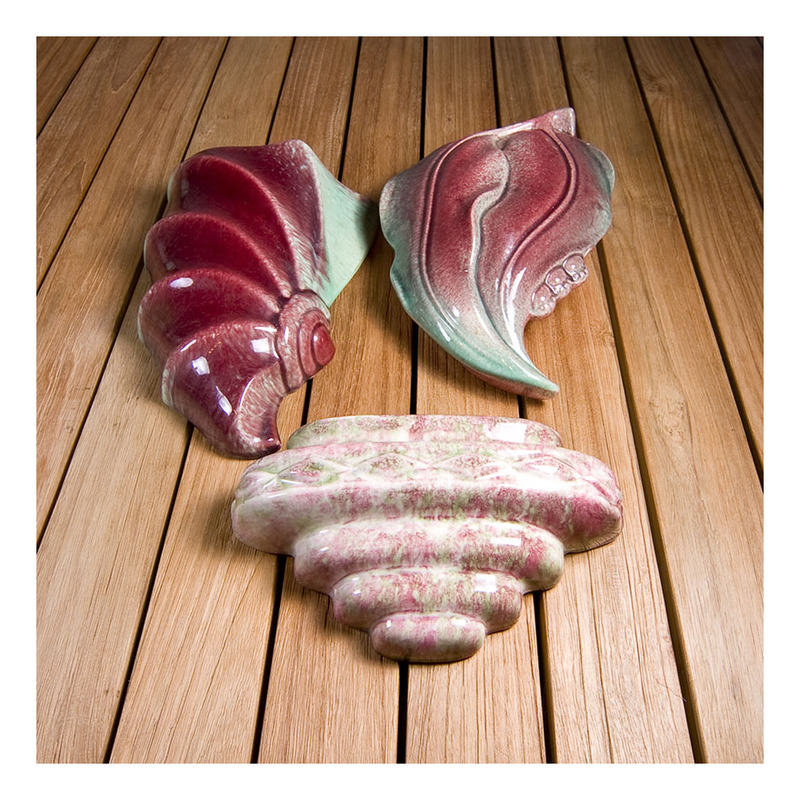 More pink & green speckled Pates pottery- here we have some delightful kitschy vase shapes. Fish and swan in the middle, with a floating flower trough to the front and a posy vase behind. 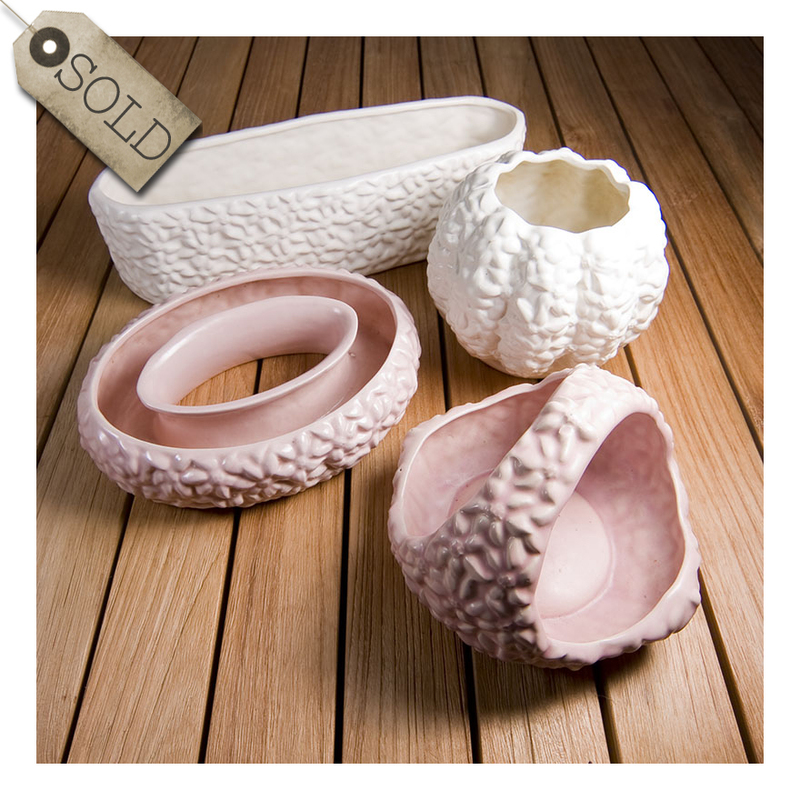 One kitschy vase does not a set make…look how good they look when grouped en masse. I’ve speculated previously that this pink and green pottery colouring was produced to match a 50s interior- it wasn’t until the 60s that the ‘Australian’ tones of green and brown were seen. I like the hand applied colour glazes- it means despite these vases being turned out in the hundreds- no two were ever the same. I have posted about Pates pottery previously [sorry, couldn’t help the alliteration] – but not, I think, the pink and green speckled Pates pottery. Pates Pottery operated out of Belmore, Sydney from 1946 -1990, quite close to where I now live. Pates’ designs and colours were influenced by the 1950s furnishing and domestic colour trends; so these three vases are instantly recognisable as coming from the 50s. The set comprises a ring ‘floating’ flower vase- with deco stylings, an upright vase with exaggerated lip and a floating flower ‘log’ vase. I don’t really understand the ‘log’ vase- but it is so associated with the 50s and was so ubiquitous that I have come to embrace its slightly kitschy realism. From the sublime to the ridiculous [which is a phrase that I use more often than is considered necessary] – here is a selection of my partner’s Newtone art deco vases. 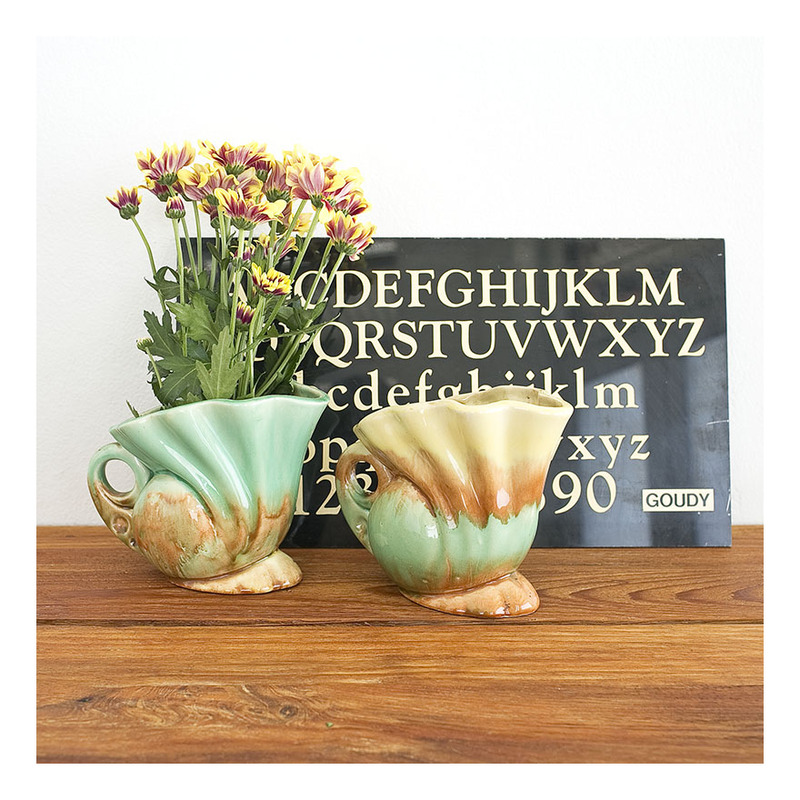 While I collect – and love- kitschy Australiana from the 40s to the 60s, my lovely partner has much more refined sensibilities and loves and collects Australian pottery from the 20s- 40s. Here is a small sample from her collection. 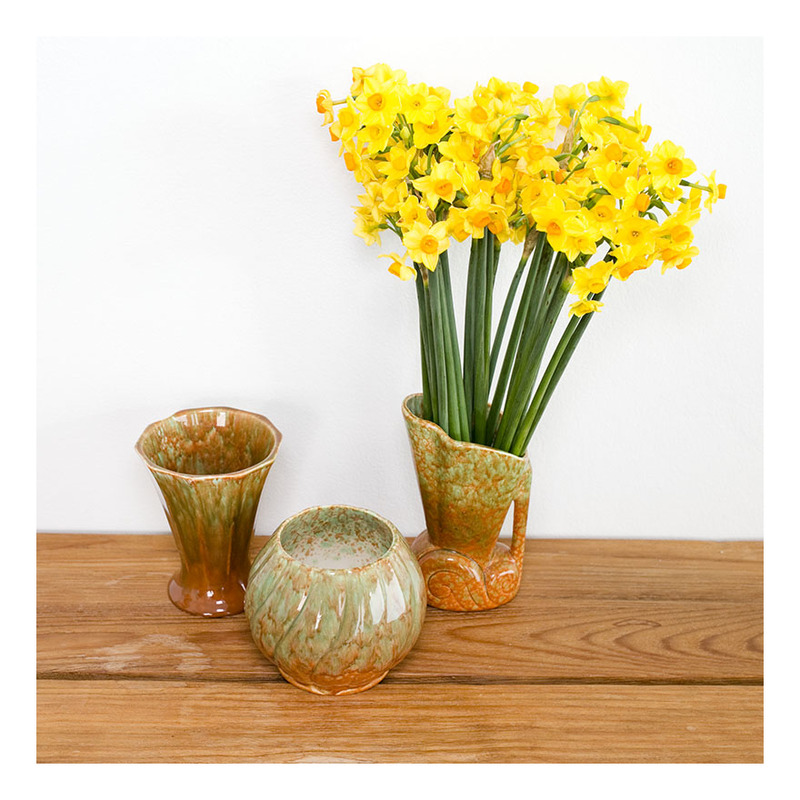 These vases showcase the green and brown colourings and art deco shapes and vase sizes. They look gorgeous amassed together. And look terrific holding flowers! Bendigo Pottery, Regal Mashman, and a vase by Clarice. 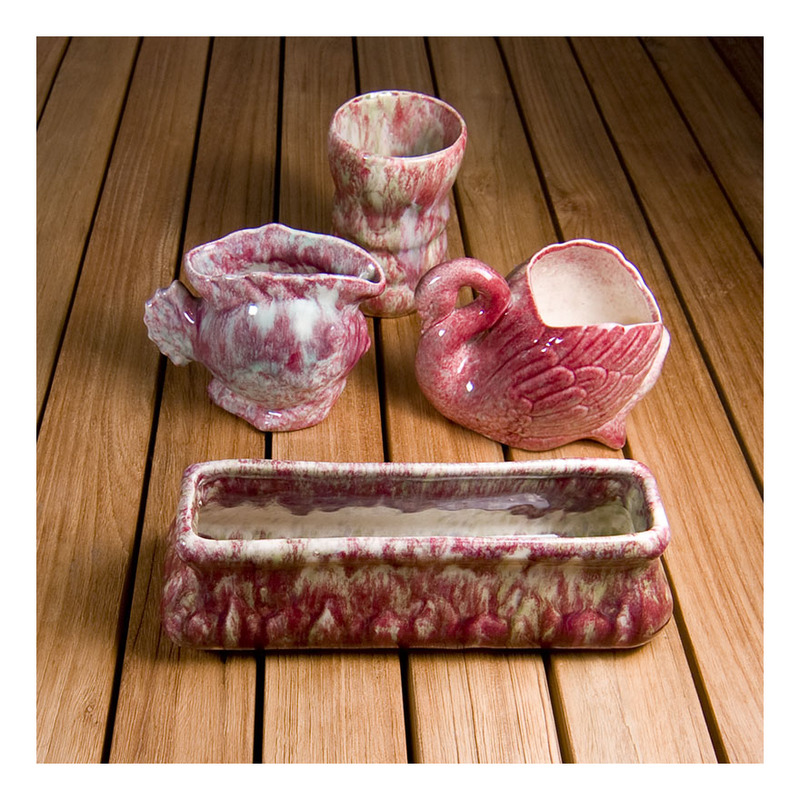 A fantastic selection of vintage Australian pottery. The asymmetrical vase on the far left and the double-handled ‘urn’ vase were both produced by Bendigo Pottery, Australia’s oldest working pottery [established in the 1850s.] The asymmetrical vase is typical of the 30s, while the larger blue urn vase was made in the 50s. The green drip vase to the centre front is signed by hand ‘Clarice 1939’. It would be nice to think this might have been made by Clarice Cliff [certainly the date is of the right period, and Clarice Cliff made plainer coloured vases earlier in her career] but I think this is an Australian piece from 1939. The matching pair of vases to the right are by Regal Mashman, a pottery that operated out of Chatswood, Sydney in the 1930s. These vases are also drip glazed, where the final glaze is a contrast to the first glaze. Some more of my Diana collection. Flannel flower is the floral emblem of NSW [and has been associated with this State since Federation in 1901.] Diana pottery in the 60s produced a number of Sydney specific floral emblems on vases and pots – some were hand painted [and quite garish in my opinion.] I like the more subtle relief work depicting the Flannel flower on these vases. These four vases showcase the four Diana vase styles that exhibited the flannel flower designs- from back to front in the image: – trough vase, round regular vase, posy ring vase and basket vase. My Diana collection finishes with these pieces from the 60s…I really can’t bring myself to embrace the pieces that were made in the 70s.